Most cake designers are used to the idea that their work is ephemeral, but it takes a rare person who is willing to spend months designing a cake, only to watch it be thrown on the floor. 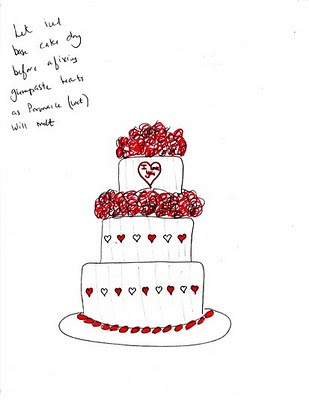 That's the challenge cake designer Nancy Linstead tackled while working on Well Done. I took Nancy's cake decorating class during my pre-production research, and it quickly became apparent that we needed the help of a seasoned professional on set. We were thrilled and greatly relieved to put the cake construction of Well Done in Nancy's capable hands. She called in fellow designers Tray Post and Jodie Vandervort to create the film's most memorable edible characters. I recently caught up with Nancy and asked her to share a few of her insights. Q: How did you come up with the design for the chef's main cake? 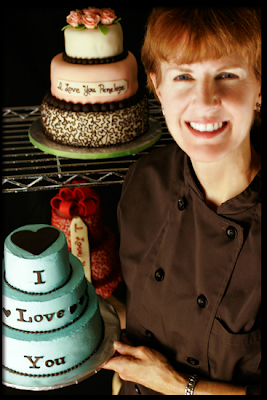 Nancy: We discussed the chef's character and I wanted to keep the cake designs simple, since Nicholas's training was as a chef and not as a pastry chef. 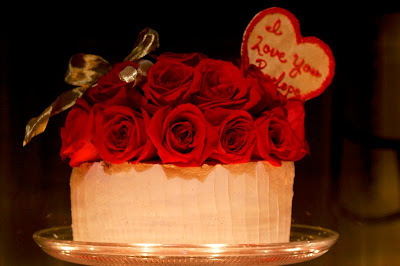 In the end we opted for the classic three-tiered chocolate cake with red roses and a heart motif. The cakes in the freezer scene were designed to show the chef's process as he tried different techniques and color palettes before his ultimate creation. I passed my notes on to Tray, and we referenced aspects of the main cake design in each freezer cake. Some cakes had truffles, another had a heart motif that carried his written message; one cake incorporated roses while another played with red on chocolate brown. which was caught on the soundtrack! you caught the shot you wanted. Q: How many cakes appeared in Well Done? Nancy: We made nine different cakes in all. Tray constructed the birthday cake and two fondant cakes for the freezer scene. 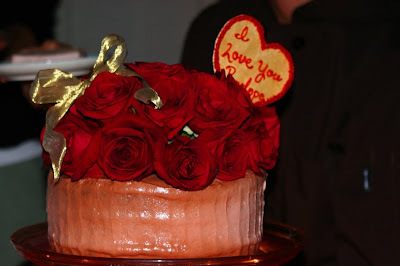 I designed the main cake and the rest of the cakes in the freezer. Jodie was a huge help the day before we shot the freezer scene, especially with the red lace cake. Q: How many times did you build the main cake? 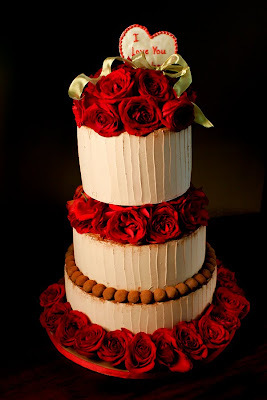 Nancy: I built dummies of the main cake in two different sizes, one of which I dressed with fresh roses and cocoa powder on at least three different days. I built two real versions on the day we filmed the cake dropping to the floor, and I made the top layer twice for the technical rehearsal and filming of the final scene. That tech rehearsal turned out to be a good thing. 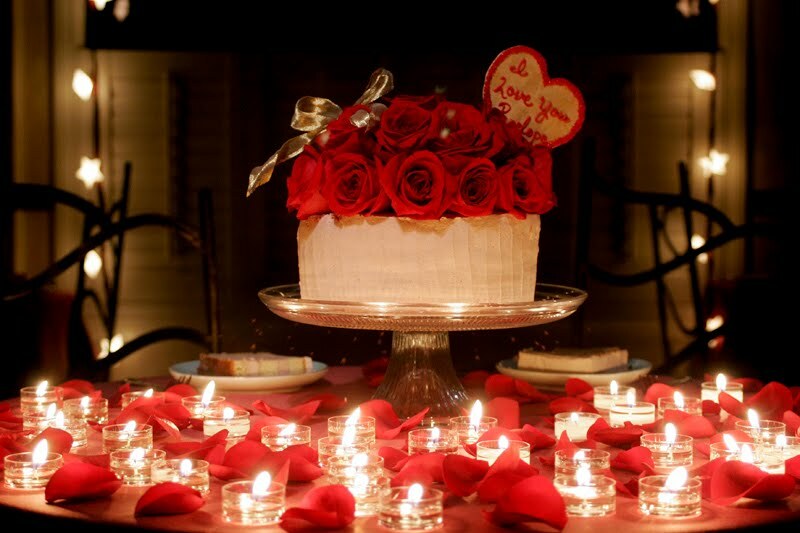 We had the top layer on a glass cake plate above a table top with several candles. The heat from the candles melted the buttercream frosting over time, so we had to shoot the cake shots first. Q: What were some of the challenges in building cakes that could survive a film set? 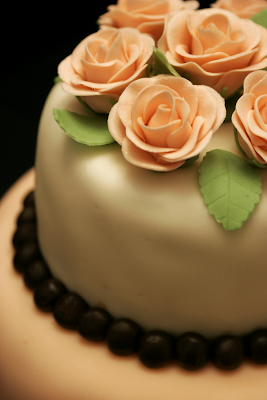 Nancy: My main challenge was to make a cake that could stand up to hot lights and be used multiple times. 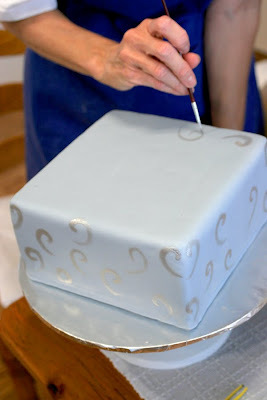 I built a styrofoam "dummy" of the main cake and iced it with plaster from Home Depot tinted brown with paint. I also rolled chocolate truffles from stiffened fondant. 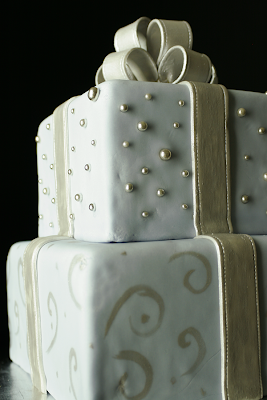 The icing and truffles hardened as they dried, and the resulting dummy could be under the lights for hours and not deteriorate. 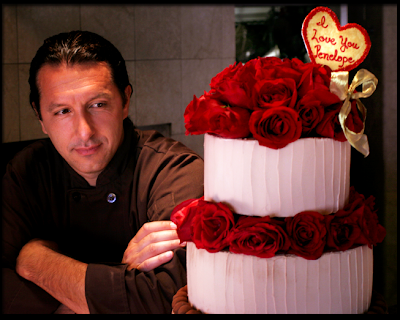 Each time we filmed I applied fresh roses and dusted the truffles with cocoa powder.